Even the casual fan of Frank Lloyd Wright knows that the great American architect was deeply indebted to Japan for its aesthetic inspirations. But few realize the debt runs both ways. During the six years he lived parttime in Tokyo, from 1917-1922, Wright designed some 14 buildings and left another, equally significant, legacy: his transformative effect on the men who helped him build the Imperial Hotel. Many of them went on to create their own masterpieces, to alter Japan's cityscapes and mentor a new generation of architects. Magnificent Obsession is the first documentary to focus exclusively on Wright's "great living creative spirit" in the only country outside America in which he lived and worked — illuminating the one remaining aspect of Wright's career that had remained obscure. Wright designed for Japan an embassy, a school, two hotels and a temporary hotel annex, a commercial-residential complex, a theater, an official residence for the prime minister and six private residences (among other buildings that may have been designed, but records have been lost). Of these, six were built: the Imperial Hotel and Annex, the Jiyu Gakuen School, the Aisaku Hayashi House, the Arinobu Fukuhara House and the Tazaemon Yamamura House. Magnificent Obsession explores these lasting monuments to Wright's genius, as well as examining the careers and work of his Japanese apprentices and emulators. 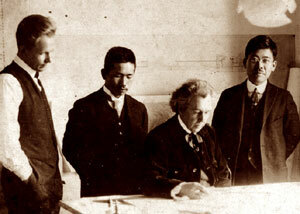 The documentary traces Wright's magnificent obsession with Japan — and Japan's with the great architect — from approximately 1890 to 2004, featuring historic and new film footage, hundreds of rare and unpublished photos, drawings and plans, and extensive interviews with Wright specialists and the descendents of his Japanese colleagues.